Rooftop our game Snipers face the protagonists of the most famous games. You'll be forced to confront Chuck Norris, Batman, Joker or Harry Potter. Win battles duels as in the Old West shooting your enemies. To win a round you have to eliminate your opponent five times. You can not imagine how many celebrities we've introduced so that they face each other. Eliminate your opponent before they kill you. We have also introduced the soundtrack of Fernanfloo to not miss the thrill of winning while playing our game Rooftop Snipers online. 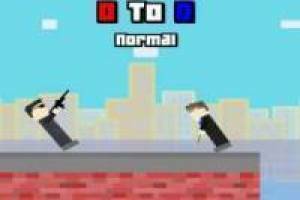 Enjoy the game Rooftop Snipers: Famous Duels, it's free, it's one of our Friv games we've selected.